In virtually all transistor sets you’ll find other, usually smaller, ceramic and mica capacitors, which are described as non-polarized. 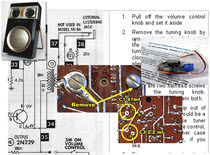 Early sets also have paper capacitors. They are often located in RF, IF, audio and tuning circuits, and come in a dizzying array of sizes, shapes and colors. The photo shows a few examples. 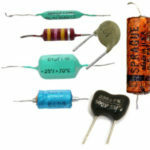 These little guys are rated in micro-microfarads, although today, folks use the term picofarad (pF) instead. Their schematic symbols look like this. 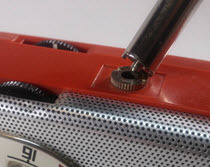 Capacitors often have date codes printed on them which can help you narrow down the age of vintage radios. Read more about that here.